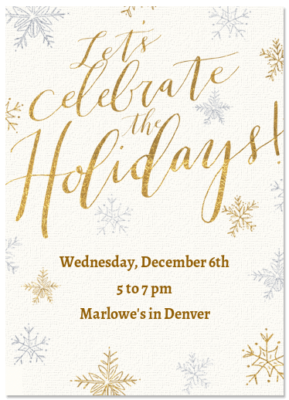 CoALL will be holding its annual holiday party on Wednesday, December 6, at Marlowe’s in Denver. There will be appetizers and drinks. Please RSVP by Monday, December 4th. Contact Abby Lindquist (amlindquist@hollandhart.com) with questions. Remember to RSVP with Abby Lindquist (amlindquist@hollandhart.com) if you plan to attend the November 15 Brown bag on Artificial Intelligence. Denver Associate Ivan London will present Nov. 15 on artificial intelligence in legal services in Bryan Cave’s Denver office. The presentation will be held as part of the Colorado Association of Law Libraries’ Brown Bag events. His presentation, “Understanding AI’s Impact on the Business of Law,” will provide insight into the potential role of artificial intelligence in legal services, challenges law firms might face, the need for innovation and the many uses for AI. London’s practice covers a wide range of legal and regulatory issues, with a focus on energy, environmental and other natural-resource matters. He has litigated disputes in civil and administrative settings, defended government enforcement proceedings and investigations, and has helped clients participate in the administrative rulemaking process and conduct compliance audits and internal investigations. London is also a member of Bryan Cave’s TechX, which is a group of Bryan Cave’s forward-thinking attorneys and other professionals designed to grow Bryan Cave’s industry-leading legal technology awareness, depth and experience. Come join us for a meeting of the firm and academic librarians. Both Susan Nevelow Mart from University of Colorado Law library and Catherine Dunn from University of Denver Law library will be in attendance. Light snacks, wine and soda will be available. RSVP to Holly Pinto by Tuesday, November 14th. Karen Selden Elected to AALL Executive Board! Congratulations to our very own Karen Selden on her election to the AALL Executive Board! This honor couldn’t have gone to a more deserving individual. 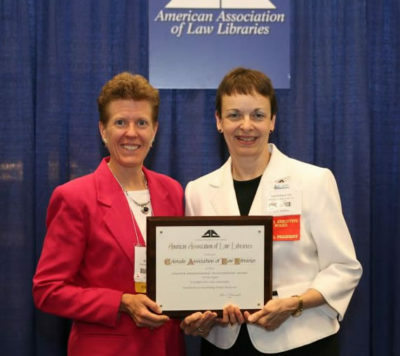 Karen has a long record of service to AALL. Heck, she was even President of CoALL way back when. Karen will serve a three year term on the Board, from 2018 to 2021, during which time she will undoubtedly represent law librarianship in Colorado in the best possible light. Here’s to an illustrious tenure in the big show, Karen. Go make us proud!